Merrick Classic has long provided dogs best-in-class natural nutrition from a wholesome balance of protein, whole grains and fruits and vegetables. Merrick Classic recipes now been improved to offer an even more palatable and easily digestible mealtime experience for the Best Dog Ever – plus refreshed premium packaging at an attractive value for pet parents. 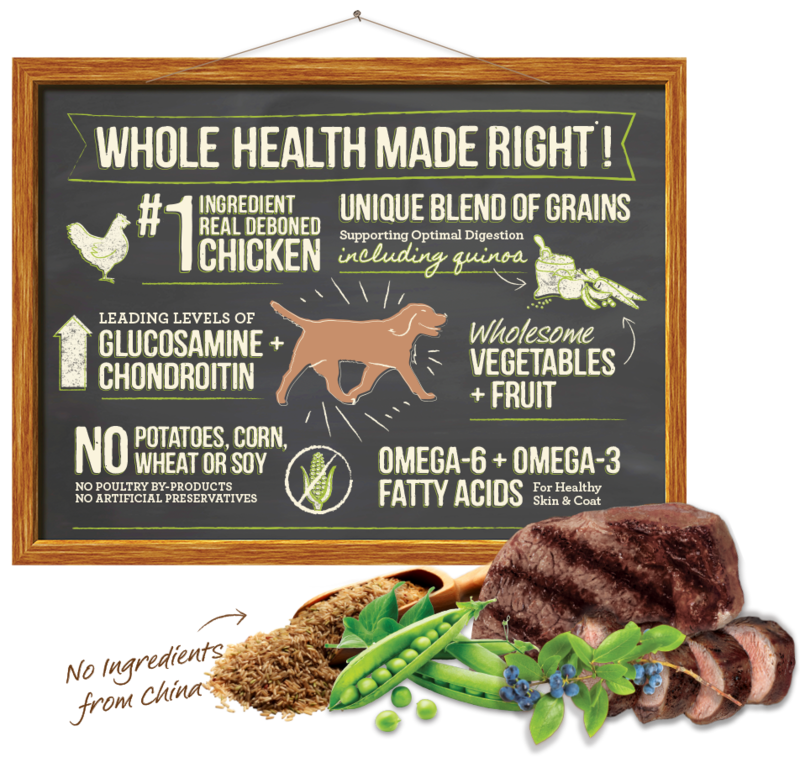 Powerful levels of Omega 6 and Omega 3 fatty acids aid in a healthy skin and coat for dogs, and leading levels of glucosamine and chondroitin foster healthy hips and joints. Merrick Classic recipes are cooked in the USA in our own kitchens, with no ingredients from China. Recipes contain no potatoes, corn, wheat or soy ingredients. Turkey, Turkey Broth,Turkey Liver, Fresh Sweet Potatoes, Fresh Carrots, Fresh Green Beans, Fresh Granny Smith Apples, Potato Starch-modified, Olive Oil, Dried Cranberries, Dried Blueberries, Calcium Carbonate, Potassium Chloride, Sodium Tripoly-phosphate, Flax Seed Oil (For Omega -3), Poultry Seasoning (Thyme, Sage, Rosemary), Yucca Schidigera Extract, Choline Chloride, Salt, Natural Caramel Color, Lecithin, Zinc Amino Acid Complex, Mixed Tocopherols. Deboned Venison, Beef Broth, Peas, Carrots, Potato, Zucchini, Apples, Dried Egg Product, Natural Pork Flavor, Potato Starch-modified, Blueberries, Canola Oil, Potassium Chloride, Calcium Carbonate, Salt, Sodium Phosphate, Vitamins (Choline Chloride, Vitamin E Supplement, Vitamin B12, d-Calcium Pantothenate, Vitamin A Supplement, Niacin, Vitamin D3 Supplement. Chicken, Chicken Broth, Chicken Liver, Carrots, Peas, Apples, Potato, Dried Egg Product, Natural Chicken Flavor, Carrageenan, Calcium Carbonate, Potassium Chloride, Vitamins (Choline Chloride, Vitamin E Supplement, Vitamin B12, d-Calcium Pantothenate, Vitamin A Supplement, Niacin, Vitamin D3 Supplement.